When Coeur came to Blender media, they had a sure challenge ahead of them. Coeur had recently undergone a re-branding effort and needed their new website to tell their story, company purpose and newly defined vision. The website they came to us with was outdated and not mobile friendly; information was difficult to find with multiple layers of navigation and design was inconsistent across varying pages on the website. With any public company, finding information online, primarily through the company’s owned website, is integral to attracting investors. If potential investors are challenged in navigating through a website, they are much more likely to leave such a website and go elsewhere. Partnering with the Blender Media team, Coeur Mining set out on a strategic roadmap to build a new website with a quick turnaround. 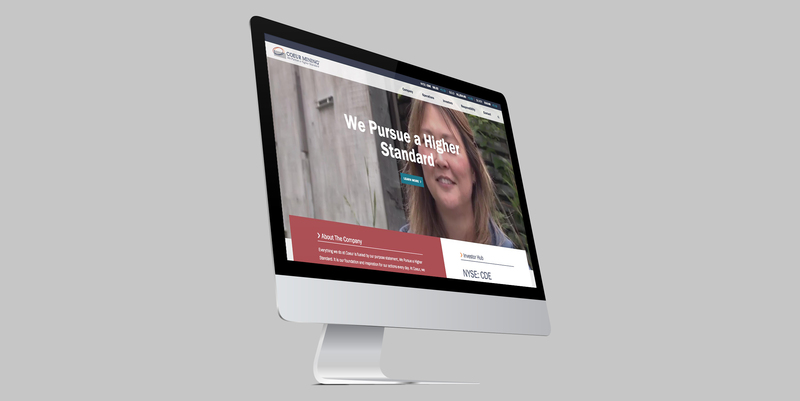 “Prior to our website overhaul, our website was outdated, static, and was not user-friendly. Our old website was overloaded with redundant webpages, and was difficult to navigate. Our new website is essentially the polar opposite of our old site. We love the fact that our new website will change and adapt with us as we grow and develop over the years. We chose Blender because they created a comfortable atmosphere from the beginning. Coeur had recently completed a re-brand effort, along with a newly defined vision and specific purpose as a business. Coeur needed to bring this new story and vision to life through their website. Providing information for investors in a quick, concise manner is integral to the success of a public company. 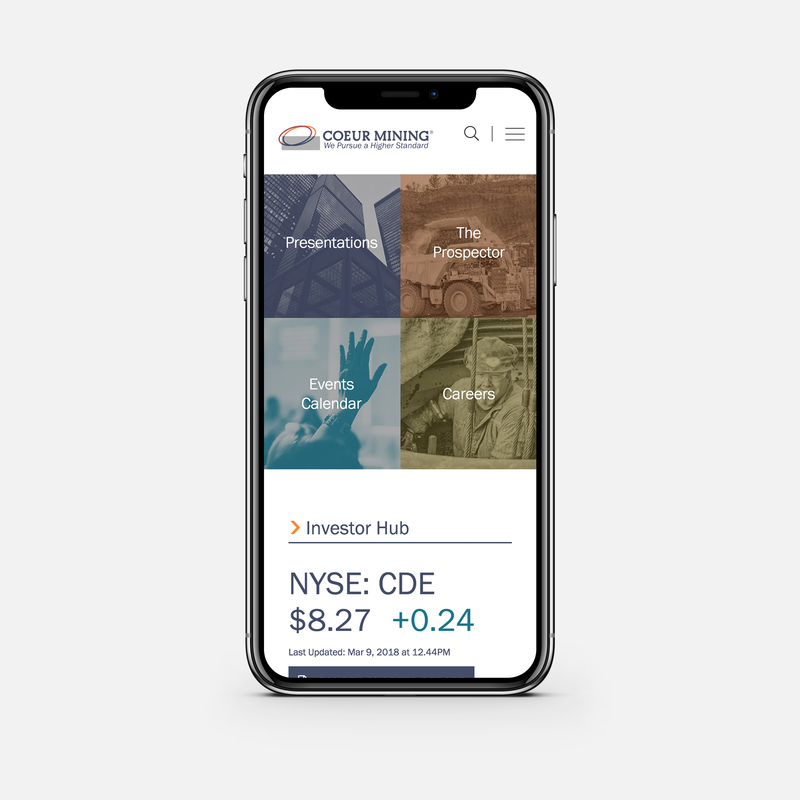 We collaborated with Coeur to build a clear and easy-to-read Investors section of the site, which included an overview of key information, events, presentations, share and stock information, analyst coverage and filings. One click and potential investors now have all of the information they need at their fingertips. When building a website, it’s important that the project goes smoothly and with efficiency in mind. As a Blender Media team, we set out to ensure this goal was achieved. From start to finish, we delivered a new website for Coeur in just three months, on-time and under budget. Great Panther Silver Limited is a primary silver mining and precious metals producer and exploration company listed on the TSX and on the NYSE American.. When Great Panther came to Blender Media, the company understood the significance of an engaging and informative website for investors, though knew they had a challenge ahead. 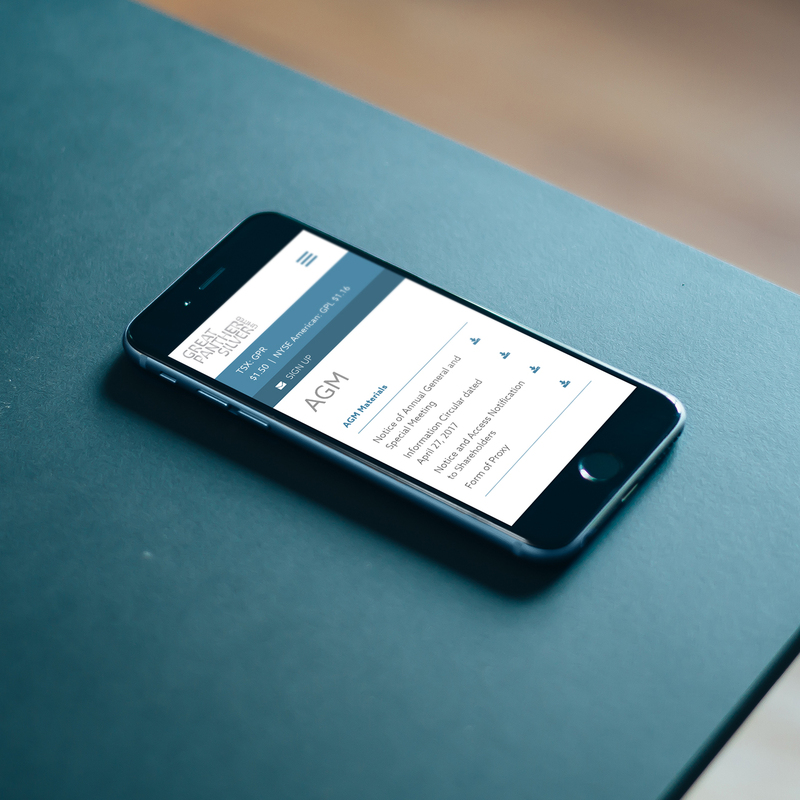 Though the client knew the importance of a mobile-friendly, interactive website, their existing website was far from this. Great Panther Silver knew that they had an outdated design and user experience, and the website was not optimized for mobile. Information for investors was difficult to find, and the client was not seeing the traffic they needed to turn website visitors into investors. Mobile search and website engagement was of the utmost importance to Great Panther Silver. While their Investor Relations team knew how integral a mobile website strategy was to their own investors, they were challenged with finding a strategic agency to help develop a custom website for their business. Great Panther Silver executes an impressive sustainability strategy with deep involvement in the community. As part of this strategy, Blender Media ensured that sustainability was a core focus on the website. Sustainability on the website covered the Great Panther Silver approach to sustainability, communities, safety & health, environment and CSR. Blender Media created an interactive map that showed project locations organized by production, advanced exploration and exploration. 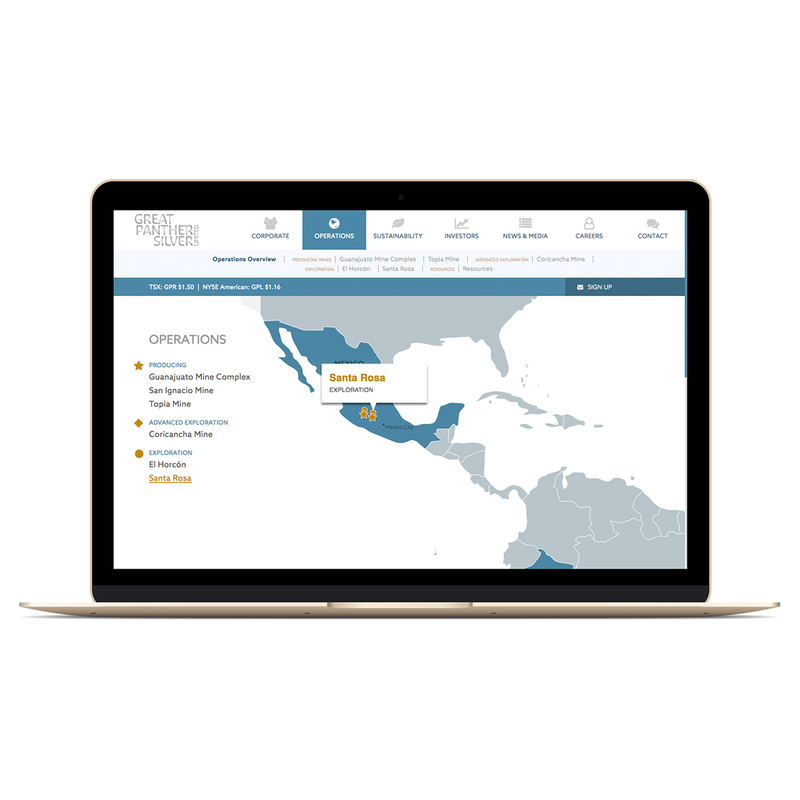 This map allows potential investors to learn more about each project area, enabling them to consume information about active mines and exploration to engage with each property. Email lead generation is important to public companies, and Great Panther Silver was no different. Blender Media made the email newsletter subscription easier to view and submit through prominent areas on the website. 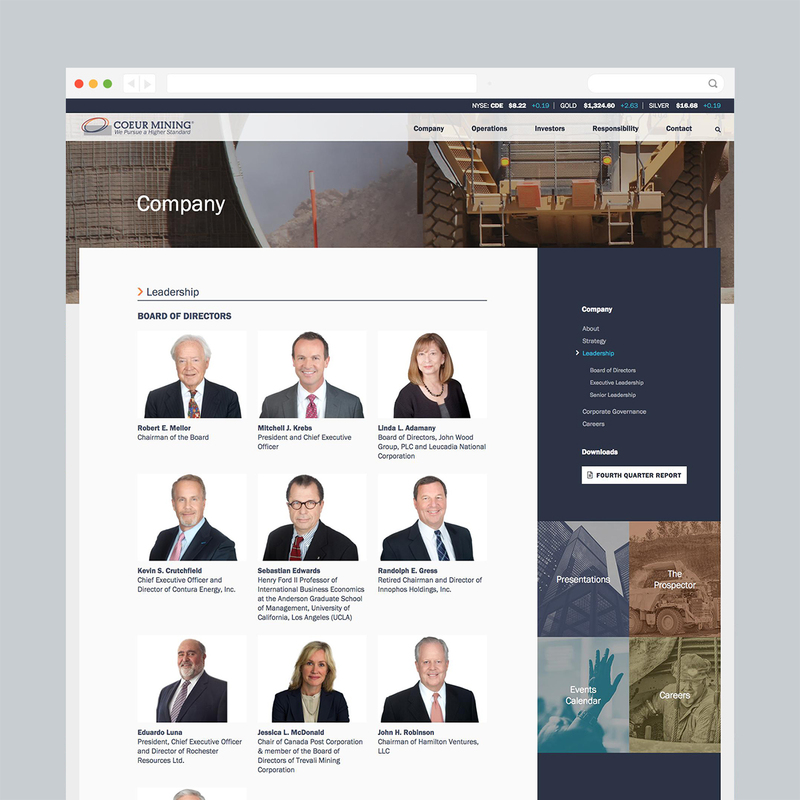 We are thrilled with the project delivered to Great Panther Silver and are proud of the custom website that was developed for this client. Website traffic and engagement has steadily increased since launch, indicative of an investor-focused and engaged website for this client. Blender is an award-winning design agency and a leader of investor marketing in North America. We’ve worked with over 500 private and publicly traded companies on all major stock exchanges including NYSE, NASDAQ, and TSX. 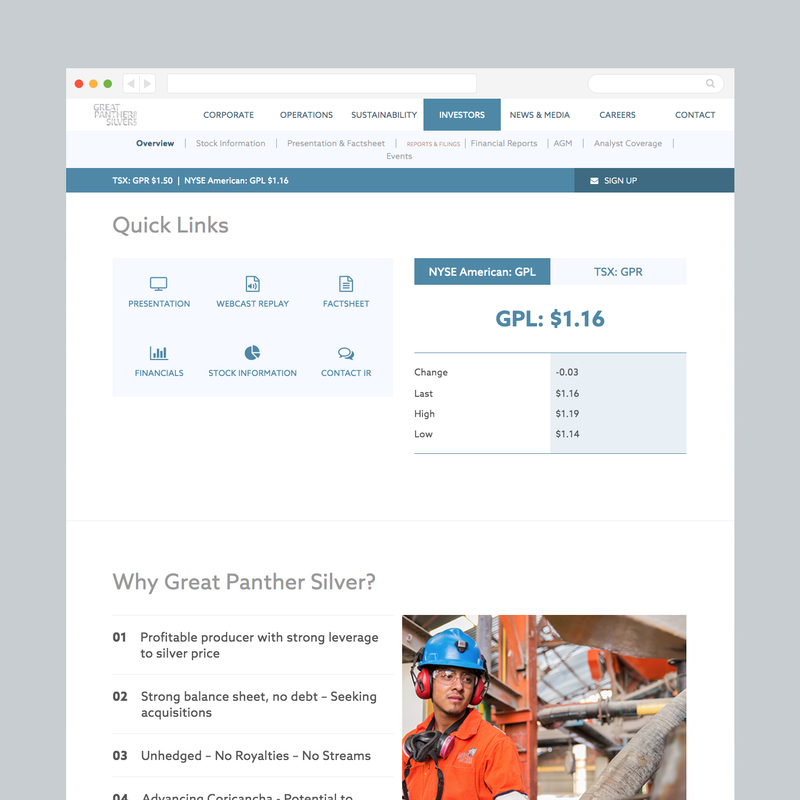 Great Panther Silver Limited is a primary silver mining and precious metals producer and exploration company listed on the TSX and on the NYSE American. 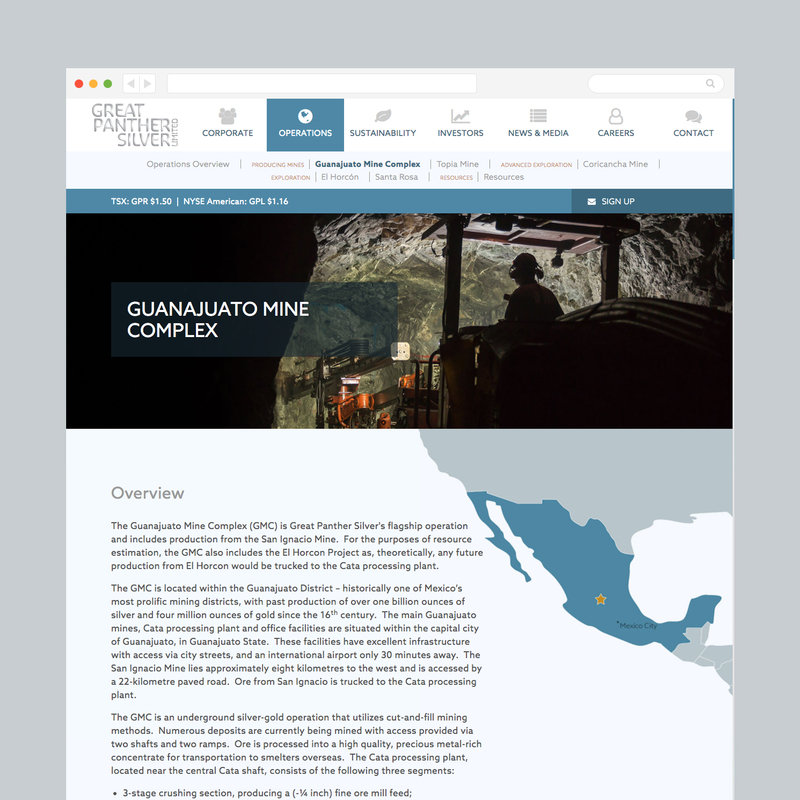 The company was founded in 1965 and primarily engages in silver, gold, zinc, lead, and copper mining in Mexico, where it owns the Topia Mine and Guanajuato Mine. Where did you come from, what are you doing now, and where are you going? Developing a brand story that speaks to your vision and what sets you apart from your competition is an important factor of good website structure. You need to figure out how to best relay all the important information for an online audience that typically has a 15 second attention span per webpage. Yeah, tricky. The best way to ensure you have a solid brand identity is by narrowing your field and asking yourself the pointed questions below. How does a great company story online help you become a major player in your industry? Here is How to establish yourself as an industry leader through your website. Question 1: What distinguishes my goals from my vision? First, let’s understand the difference between a company ‘goal’ and company ‘vision’. Goals are most often concrete steps your company will take in the next few years to achieve attainable milestones. These goals should be aligned with the interests of your company, your investors, and all others involved. A vision, however, is usually more abstract. Visions are something you hope to achieve in the future, and can be a bit more far-reaching. A vision often includes the way you see your company impacting the future and what it’s place in the world will be. When developing a brand story, make sure to separate your concrete five year goals from your aspirations for the distant future. Question 2: How would I explain my product/service in one sentence? Every company needs to be able to explain their main service in an ‘elevator pitch’. If it takes more than a few sentences to explain your ‘About Us’, it’s going to be very difficult to have a clear and straightforward content strategy on your website. It can be difficult to be concise, so start by writing everything that’s important and then drastically cut back until you have two clear sentences. Question 3: What is one thing I offer that none of my competitors do? Nothing kills a company’s website more than getting lost in the crowd. When developing a brand story, you should first do research on all your competitors. What elements are they pitching heavily on their websites? How do they structure their most important information? Did you develop your company because you saw something was lacking in your industry? What was that one thing? Find what you do that’s unique, even if it’s something small like extending your hours of operation to accommodate both east and west coast markets. Highlight those unique aspects on your website. You can also learn from the masters and read 6 lessons from famous companies on creating a killer brand. Question 4: What are three highlights about my company that investors would be interested in? If question 3 was about researching your competitors, this question is about getting into the mind of your potential investors. What elements are important to investors of your industry, and how many of those boxes do you tick? If you’re a mining company, how many in-production projects do you have vs. exploration? Are any of your sites 100% owned? No one understands the assets of your industry like you. If you are newer and have yet to make any major strides, what are some concrete ways you’ve been moving towards your goals? Sometimes even showing determination and highlighting a strong plan for the future is enough to hook an investor. Question 5: How have I failed? This is a big one in developing your brand story, even if it’s kept as an internal question (we don’t mean you should be plastering your failures all over your website). What were some of the major setbacks in developing your company? Are they issues that could arise again? And most importantly, if a bit cheesy, what have you learned from your failures and how will you grow? Often analyzing your past failures will help you build more targeted goals. Question 6: Why am I here? The last question is the one abstract one of the bunch and might even include a bit of soul searching. But really, ask yourself: why are you here? What makes you work towards your company goals and vision every day? What is it about your company that you believe in? Get personal in thinking, because it’s most likely the reasons you love your company that will resonate the most with your audience. Web audiences are smart, and can tell when a company’s vision is ghostwritten or crafted from a template. Allow your audience to see the human side of your company and why you’re more than just a bunch of people in a building. Developing a brand story means nothing if only a few people in your company understand what you’re all doing there. Every single person who works for you should understand as well. If you’re developing a brand story, make sure everyone else also knows the company’s goals and why they give up their time each day to be working with you. A common goal makes for a hard working and well-oiled machine. Happy researching and happy brand developing! Why is an eyeglass retailer attracting so many eyeballs? On the surface, Warby Parker doesn’t seem different than any other company. They sell a product—eyeglasses—mostly online. They have a website where you can shop. They have a blog. They create year-in-review reports. But what’s truly brilliant about Warby Parker is how they’ve managed to transform every ‘normal’ aspect of a company and its website into a brand worth salivating over. The company is rooted in rebellion, founded by four friends in 2010 who were sick of a few large firms controlling the eyewear industry. This iconoclasm contributes to the fresh young vibes coursing through their brand, as well as the non-profit ‘buy one, give one’ mission that’s a cornerstone of their company. We’ve taken five ‘normal’ business elements such as a company’s website and year-in-review and examined how Warby Parker has turned each one into something consumers look forward to experiencing. 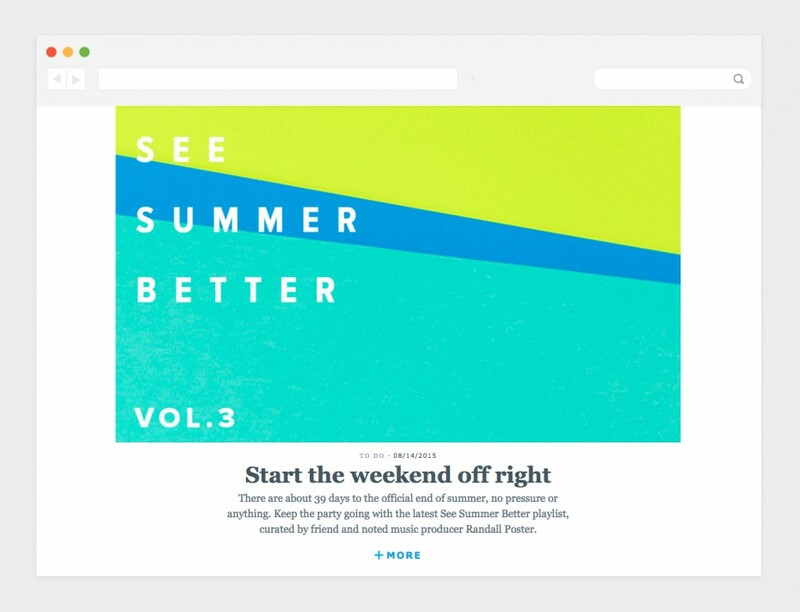 Warby Parker’s frequently updated blog is an organized chaos of staff book recommendations, music playlists for fall, and ’39 things to do before summer ends’. Though they also publish articles about new glasses styles and share their collaborations with various brands, they know that promoting their brand means more than pushing product. They’re not just selling the glasses they create, but the edgy lifestyle that comes with wearing their glasses. As an e-commerce company, Warby Parker knows that their website drives their business. It can’t just look nice, but must work supremely well for consumers shopping online. When we browsed Warby Parker’s website, the first thing we noticed was how easy it was to get around. Dropdowns offer options to shop the entire collection, but also offer featured selections like their fall 2015, original, and circuit wear collections Every detail of the site has been examined, down to the email signup button asking you to ‘stay in the loop’ and the sketched paper airplanes that zoom by in the corner of your screen. 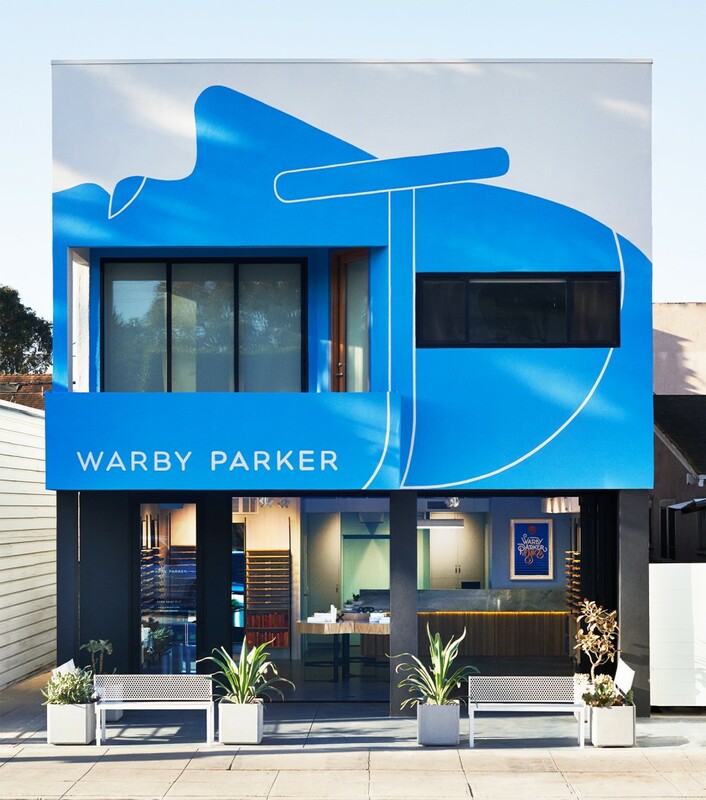 Warby Parker’s colloquial tone creates a perfect separation from the ‘hoity-toity’ atmosphere often associated with luxury eyewear companies. 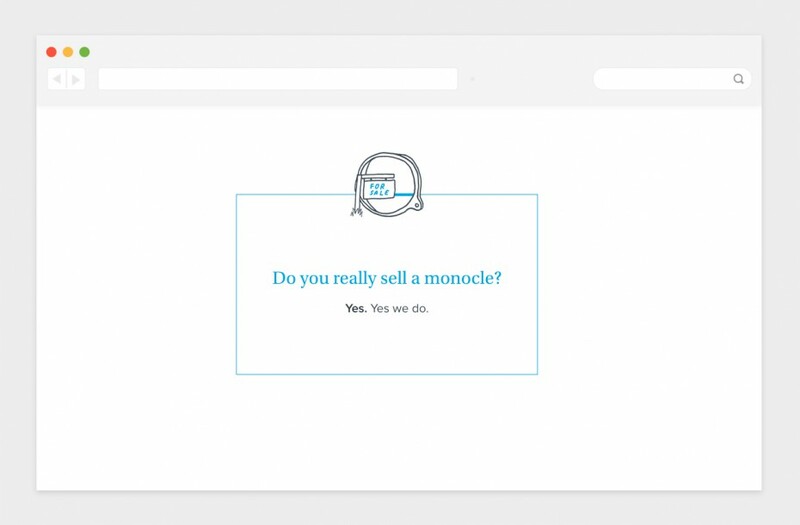 They poke fun at themselves on their website (like teasing the fact that, yes, they do actually sell monocles) and their blog sounds like real people are offering you style and lifestyle advice. 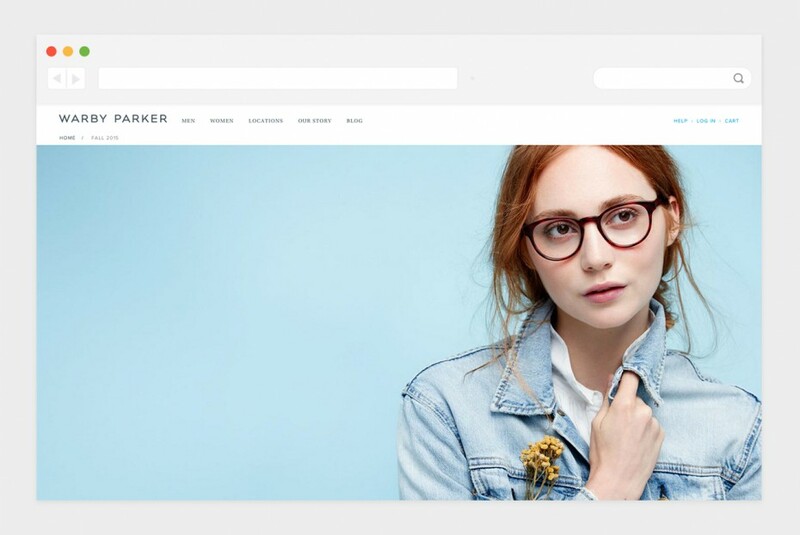 While some companies keep their blog tone conversational but stick to formalities and the hard-sell on their corporate site, with Warby Parker it’s what you see is what you get. As they say on their website, they were “founded with a rebellious spirit and a lofty objective: to offer designer eyewear at a revolutionary price”. Warby Parker started as an online retailer, but have since opened numerous locations throughout the U.S. It was important for the company that their stores had a homey vibe: they’re promoted as “featuring glasses, books, along with other surprising treats”. Some locations, however, are more ‘party’ than ‘homey’. A writer from FastCompany describes his visit to Warby Parker’s Los Angeles store as “the space is decked out like a 1950’s beach club…servers offer martinis and champagne flutes and trays of crackers topped with avocado hummus…guests gravitate to the full-length mirrors and the glasses, which are sticked invitingly on open wood shelves”. It’s a brilliant maneuver. 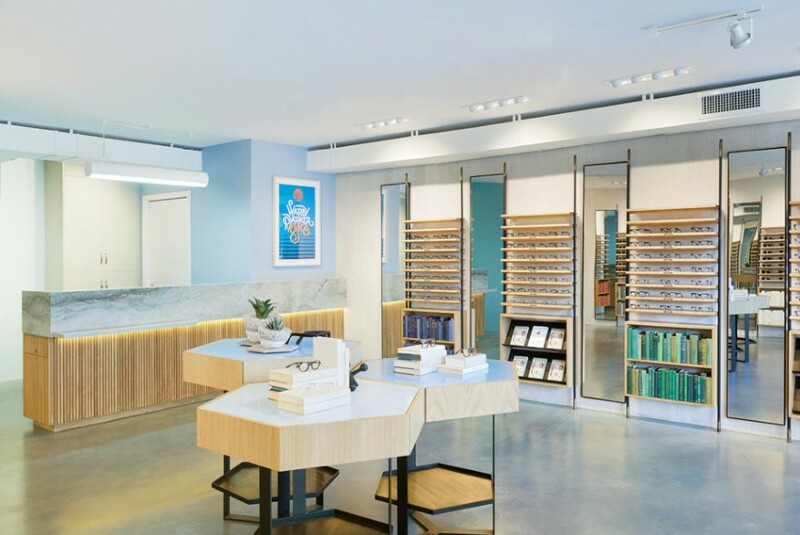 Warby Parker stores include the luxurious feeling of buying designer glasses without the part everyone hates: the high prices of the glasses themselves. Anyone visiting their brick and mortar stores can feel expensive and pampered, while still leaving feeling like they made the right choice going with the Warby Parker rather than a monopolizing corporate brand. So this is the coolest. To promote their 2014 Year-in-Review, something all companies put out but barely anyone reads, Warby Parker created a fun online generator called ‘Make Your Own Annual Report’. The generator asks you questions like your favourite colour, your average mood, and the emoji that most describes you. Once you’re done they create a nicely designed and hilarious ‘report’ of your own year. At the bottom of your report, you can share on social media as well as (aha!) view the Year-In-Review that Warby Parker made for themselves. You can still play around with the generator here. Try it out! Love her or hate her, there is no denying that singer Taylor Swift has essentially taken over the world in the past year. Since the release of her highly anticipated album 1989 last September, she’s been on the cover of more magazines (we’re talking TIME and Rolling Stone here, not just your run-of-the-mill US Weekly) and attracted more media attention than any other icon. And, hard to believe, being under a constant microphone has mostly resulted in good press and more adoring fans. There’s a lot to learn from this media empress; articles about the genius of her marketing and branding overwhelm the internet. 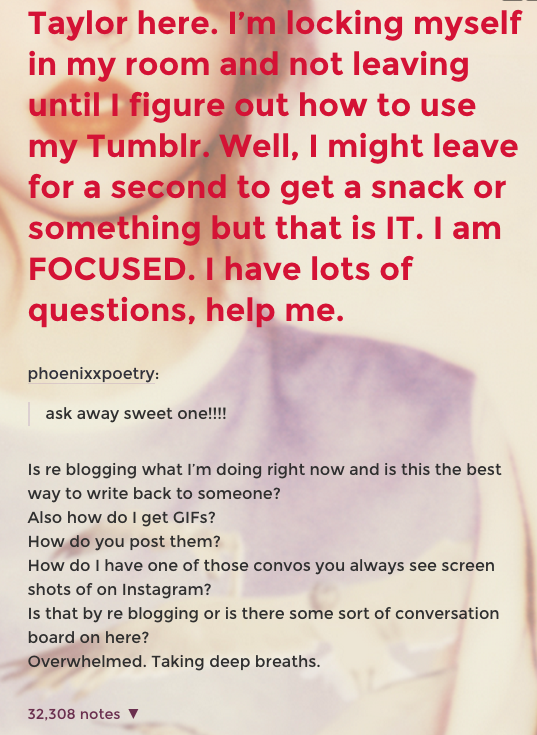 Swift also knows how to transform every social media outlet from Tumblr to Youtube (we doubt she’s on Google + though) into blinding beacons where she signals her massive fandom to rush to her aid and promote her next idea. You may be reading this thinking, her methods seem to be all kittens and fresh baked cookies what the hell am I supposed to do with that? Stay with us, here. Because we want to pull all that branding power from Taylor Swift and imagine if that was channeled into investor marketing. Why? Because we can, and because we may or may not be victims of this new disorder. We’ve said this before, and we’ll say once again: many people forget that investor communications is just a form of marketing. It’s telling a good story. It’s showcasing your company in such a way so others will not only like you, but trust you enough to support you and become a part of your story, too. So we’re examining, in Taylor Swift GIFs, how your investor marketing strategy could improve by taking some tips from the 25 year old marketing genius. Taylor Swift is is known for her #squad, or the collection of friends constantly surrounding her and going on outings with her. Though she spends a lot of her time with Victoria’s Secret models and the like, Taylor Swift is very artful at making friendships outside her expected sphere. Inc. Magazine writes “Swift is forging partnerships with unexpected figures, such as Ellen Pompeo and Mariska Hargitay…both represent a largely different demographic from the one Swift typically engages”. In her now infamous Bad Blood music video, Swift showcases to the world that nearly every celebrity is her best friend, from rapper Kendrick Lamar to icon Cindy Crawford. As she branches out and makes connections with different demographics, her fanbase broadens as well. Swift has also been making a point to invite both already famous celebrities and up-and-coming stars to share the stage with her during her 1989 World Tour. One example of a guest that was out of her normal ‘arena’ included the night she invited the U.S. women’s soccer team on stage to celebrate with her after their World Cup win. Always be thinking about how you can reach people outside your normal group of contacts. Though certain investors may not seem like the most obvious choice to connect with, you never know where a good conversation could lead you. Get your name out there and go to other events that aren’t specifically within your industry. Heard of the 1989 Secret Sessions? They were a brilliant move by Taylor and her marketing team. Swift invited different groups of 89 fans from across the country to intimate house parties at one of her or her parents’ houses. She described them as “mini living room house parties where I’m going to be playing them the album first”. She baked them cookies, secretly played them the whole album a month before its release date, and took pictures with each person. She then made each fan swear not to share what they had been up to until the official release of the album. Fans left the event in various stages of weeping, all the while proclaiming they had “literally the best day of our lives”. Reward brand loyalty. If you publish content such as whitepapers or e-books, create the next one exclusively for those who’ve been signed up to receive your email updates or newsletter. Think of ways to make your community feel special, especially those who have been rooting for your company since the beginning. One easy and not too expensive way to do this is drop off a ‘just because’ type gift at your most loyal client offices. Everyone can give client gifts during the holidays. Challenge the norm and randomly do it in the middle of July. Taylor Swift speaks to her fans like they’re actually her friends. She tweets awkward moments she has during the day, she pleads with them to help her figure out the more confusing aspects of social media, and she has no problem making fun of herself. Swift is also famous for something dubbed as ‘Taylurking’ where she intensely follows her fans on social media and learns about them and their hardships. She then often surprises certain fans with presents or nice handwritten letters. Encourage investors and other interested parties to ask you questions on social media! Start a live-chat with people on Twitter during your latest earnings call, and speak to them just like you’d be talking across the table to someone. And don’t be afraid to be a little goofy sometimes, as long as you know the boundaries. Remember: just be out there and be human! Taylor doesn’t like it when her fans have to wait around. She often rewards patient fans with exclusive backstage passes, and released a deluxe version of her album exclusively at Target, because she said she felt that’s where the majority of her fans would shop. She also recently responded to a social media plea from a senior citizen theatre company who were denied the rights to play her song ‘Shake it Off’ with their closing number. Swift bypassed her people who had originally denied the troupe the rights, and tweeted out that she personally would grant them permission and wished them luck on their opening night. Really think about what investors will want to see, and prioritize that information on your investor website and with your marketing materials. Don’t make them search for that necessary public company info; the easier and more intuitive their online experience with your company is, the better. Taylor released a deluxe version of her 1989 album that included extra songs as well as what she’s named ‘Memos’. These memos are short audio recordings of her in the studio with her producers and other members of her team. You can hear her figuring out the beginning elements of the now famous songs. In releasing such a personal element of the process, fans feel like they can really connect to her songwriting. Show your community and investors what the day-to-day life of your company looks like. Share behind the scenes pictures on social media, tweet Did You Know’s and interesting stats about how you became a company. Publish a letter from the CEO, or host a video interview with someone in the company. Making investors feel like they have an all-access pass to what’s going on with you is a great way to make them feel included and to stay interested and involved in your story. Just listen to her song ‘Shake it Off’, if you haven’t already. Or just read the title. As a public company, it’s almost guaranteed that some decisions will face criticism from the investment community. While it is important to listen to those criticisms and always be aware of the conversations happening surrounding you, make sure to also take these comments in stride and stay true to your mission and your brand. Thanks for the inspiration Taylor! What if a 100 year old person was better at social media than you? A lot of brands better be asking themselves this question, because General Electric is 123 years old this year and are rocking every social media platform from LinkedIn to Vine. It’s not just about the brand’s commanding presence on social media, however. We’re more interested in the way a century-old company who most people know best through lightbulbs and refrigerators can take every aspect of social media, from GIFs to infographics, and integrate them seamlessly into their strategy. Here are some main reasons why GE kills it daily on social media. GE always has a social media contest going on. Last year they took to Vine to get people talking about science. Their #6SecondScienceFair invited everyone to interact with their brand by capturing a 6 second video of the coolest science experiment they could create. GE posted their favourites on their own social media page, and created a tumblr account for all the best videos. Like the experts they are, GE made sure to tie the fun contest back to their main message of influencing science and technology. (They also won a shiny award for this educational video series at the 2014 Cannes Lions advertising competition). General Electric is known for being early adopters of new social media platforms (for instance they got on Vine one day after the video-sharing app launched). Now, GIFS within tweets is the new image within tweets. One brilliant aspect of GE’s social media strategy is that they know how to take each emerging platform or trend and seamlessly integrate it with their mission. Check out how they put GIFS to work in the example below. An inside glimpse of a new ice nugget maker? Sweet, I’m in. GE has also been all over Periscope lately, the new video live-streaming app. Their most recent endeavour included a ‘DroneWeek’ where, using a modified drone, General Electric gave social media followers an up-close and personal look at the biggest and tallest machines. General Electric is proud of everything they create, and they let people know. Their Instagram account is full of behind the scenes images and videos detailing a day in the life of a GE employee as well as glimpse s of testing facilities, aviation grounds, and wind turbine fields. Their Instagram is a machine enthusiast’s fantasy: who doesn’t like giant pictures of airplane engines and gas turbine load compressors? Behind the scenes snapshots are also smart because they increase the brand’s positive reputation and build enthusiasm and trust between the company and its social media followers. GE promotes the new technologies they’re working on through social media the best possible way: they educate users about what they’re building. Their YouTube series ‘Invention Factory’ provides an investigation on some of humanity’s biggest questions, and how GE is looking for answers. They’ve produced many videos such as the one below to create enthusiasm about their big picture work. GE seriously promotes their technology and their mission, but they also know when to loosen their ties and have a little fun. They’re big fans of emojis on Twitter. (And in general, check out their whole EmojiScience campaign). While some companies may believe that social media and investor relations doesn’t mix, General Electric challenges that idea with a seamless integration between the two worlds. (We also think it’s a perfect marriage, and we’ve written about it before). General electric releases investor highlights on their social media channels with bold images for easy sharing and consumption. Keeping investors in-the-know on social media makes for a more engaged investor audience. It’s clear that GE has a lot of fun on social media, and they love engaging other brands. A lot of times GE’s Twitter will publish an Emoji puzzler concerning a historic scientific breakthrough and will call out other companies and invite them to take a guess. They also love congratulatory tweets, and spread love to everyone from NASA to Bill Nye the Science Guy. It’s Canada’s turn! Two weeks ago we created an infographic with the biggest public company in each U.S. state based on market capitalization. If you haven’t seen that yet, check it out here. This week we’re bringing it closer to home and want to know the biggest public company in 2015 to come out of every Province. From BC to Nova Scotia, we’ve covered them all below. Hover over each of the ten provinces to learn a fun fact about the top company. And see a more detailed breakdown of market cap and stock symbol in the chart below! To navigate the map easier on mobile, click the home button after you’ve zoomed to bring the map back to its original position. Using NASDAQ’s real-time screening data and TMX Money’s Investor Discovery tools we analyzed Canadian companies trading on all major U.S. and Canadian stock exchanges, as well as the TSX Venture Exchange. We then sorted by market capitalization for each of the ten provinces. Each company must be headquartered in their corresponding province to be #1. Data is as of end of trading Tuesday, August 18, 2015. Take some tips from the masters. There’s a reason we’ve all heard of these names, and although size, budget, and success may all be different between factors between these brand curators and your company’s brand, there’s still valuable lessons they can teach you about standing out. Take a look at these six lessons from companies who’ve mastered everything from email newsletter copy to reviving 90’s hip hop. Sprite’s been doing a bit of marketing speed-dating lately; they just switched creative agencies for the fourth time in three years. Flashback to 1994 when they launched the now iconic ‘Obey Your Thirst’ slogan with a campaign featuring underground hip-hop up stars and freestylers like Nas, AZ, and Grand Puba. Over 20 years later, Sprite is returning to the ‘Obey your Thirst’ campaign and to their hip-hop roots. Sprite partnered with The Fader magazine to create a video series aptly titled ‘Obey your Verse’ featuring big names like Drake and Nas, alongside shining up-and-comers Vince Staples and Isaiah Rashad. The Fader president Andy Cohn spoke to Contently about the campaign, saying “I think Sprite had a really good handle on how they wanted to relaunch ‘Obey Your Thirst’ because I think they realized they had a legacy they could trade on“. The new twist on the famous 90’s campaign has been very successful; the series has totalled more than 1 million video views so far. Cohn also spoke of how the legacy of ‘Obey Your Thirst’ with famous rappers was so easy to rejuvenate because “ever artist we talked to…knew about Sprite and ‘Obey Your Thirst’ from 20 years ago'”. 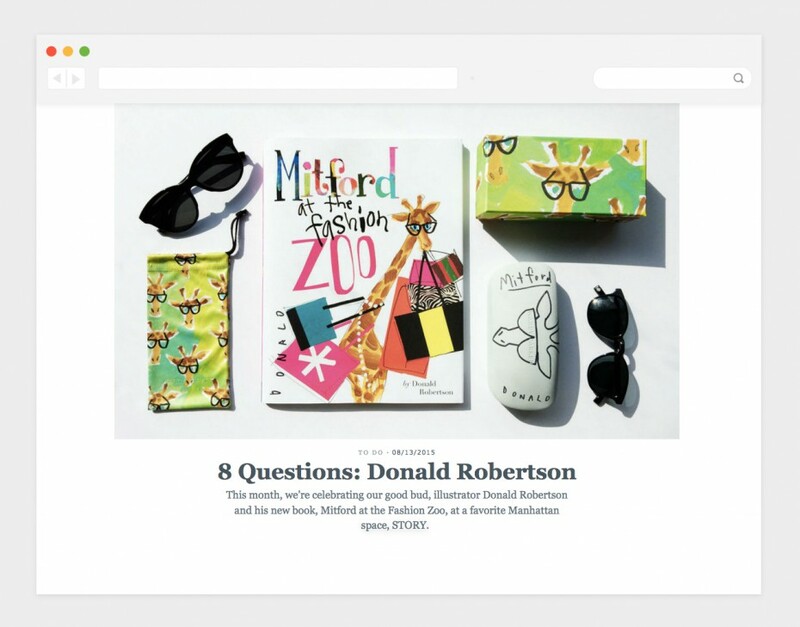 If you look up Mailchimp’s public Style Guide, you’ll get pages and pages of content explicitly explaining a Mailchimp employee’s responsibility to help customers in a friendly and informative way. They’ve even created a whole website called Voice and Tone full of potential conversations between a user and Mailchimp, and appropriate way to respond. 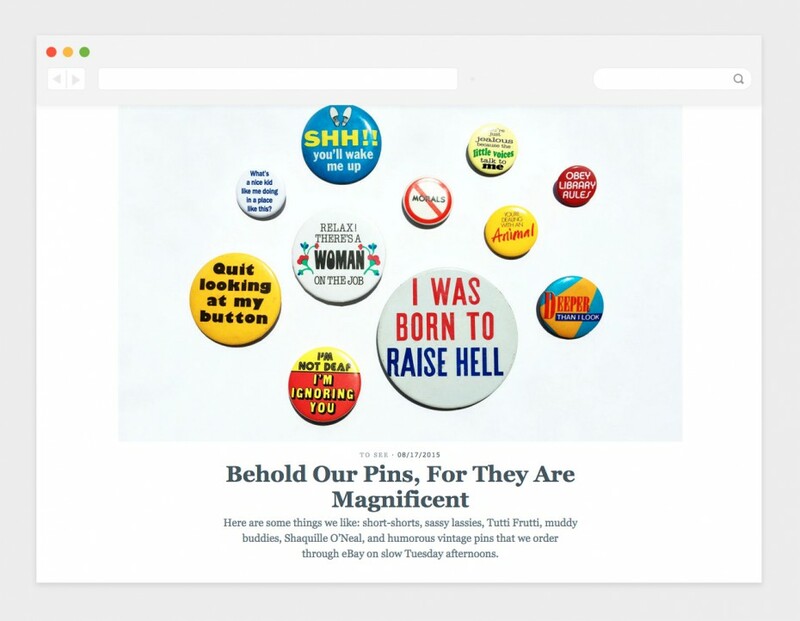 What you’re seeing is Mailchimp nailing the importance of frank and personable communication. Isn’t it refreshing when a company’s support line speaks to you like, well, the real human being that they are? Growing from a brand who sold soap to a well-known advocator for all women’s beauty is quite a feat. Dove’s “Campaign for Real-Beauty” evolved in 2004 and still runs strong in their ads today. In the past few years, they’ve also become experts at making viral videos. The brilliance of these videos comes with the underlying core message in each of them: a move to inspire self esteem in women and encouraging all girls to reach their full potential. Whether their ads focus on Real-Beauty sketches, choosing whether to walk through a door that says ‘Beautiful’ or ‘Average’, or teaching young girls to embrace their curly hair, each of Dove’s ads trace back to their social mission statement of creating “a world where beauty is a source of confidence, and not anxiety”. Other brands have begun to follow Dove’s lead, such as the Always #LikeAGirl campaign and CoverGirl’s #GirlsCan empowerment ads. 2015 marked GoDaddy’s 11th ad appearance in the Super Bowl. Over the last decade, GoDaddy’s Super Bowl commercials have been some of the most controversial and some of the weirdest ones out there, but definitely also the most talked about. Their bold marketing moves and insistence on being surprising year after year has cemented them as one of the country’s most recognizable brands. And what’s their thing? Providing website domains. It’s not the spiciest industry out there, but it’s a safe bet that anyone you ask has at least heard the name ‘GoDaddy’, even if they’re not sure what exactly the company does. But that brand recognizability is exactly what the company needs to keep doors open. This isn’t to say taking plunging risks like GoDaddy is always the smartest move (they’ve definitely fallen on their faces a few times), but the idea remains an inspiring one. If a website domain company can be one of the most talked about companies out there, they’re certainly doing something right. Lululemon’s brand dominates their industry. The yoga-inspired athletic apparel company has been so successful for many reasons, especially the way they encourage an entire healthy lifestyle as well as selling their product. Lululemon’s ‘good vibes’ and lifestyle branding are driven by their lesser known talent online: their killer content creation. Lululemon’s daily email newsletters are brilliant moments of witty copy, and their blog is a space for everything from wellness articles to profiles on up-and-coming folk singers. They’ve recently also released a seven part podcast as part of their one week meditation challenge. The constant contact a user receives online from the podcasts, interviews, and blogs establishes Lululemon’s brand beyond simply producing comfy yoga pants. The become that super healthy friend who you’ve always admired who’s also there to motivate you with some good vibes and great reads. Heard of ‘Ludicrous Mode?’ Well, it’s Tesla’s new addition to the Model S sedan and Model X SUV that’s going to kick the car from 0 to 60 mph in 2.8 seconds, and the SUV in 3.3. It’s also a nod to one of the greatest movies of all time (no judgement, it’s a classic). Elon Musk announced the new speed last month, as well as promising his adoring fans audience that “he’ll launch an all-new Roadster in four years” (Bloomberg). This announcement comes only a few months after the unveiling of Tesla’s next venture the ‘Powerwall’, their own sustainable home battery. The lesson here, in essence, is that Tesla refuses to quit. They’re pushing into multiple industries and demolishing all expectations along the way. There’s a reason they’re called “the brand of the year, decade and possibly century” (Forbes). Even if you’re not on the Elon Musk level, there can be strong value in refusing to settle and constantly pushing out new ideas and ways to evolve as a company. The energy surrounding Tesla and its supporters seems more like fans at a rock concert than shareholders and consumers. That’s a sign of how crucial Tesla’s brand has been in their success. Now, it’s all about where they’ll go from here. Maybe all the way to plaid? If you didn’t understand that, you didn’t click the movie link.